Cricket, now phrased as the unendorsed national sport of India, has got the olden times allied with its existence in the country. Even though the National game of India being Hockey, People cherishes and is fond of the Game cricket. The oldest allusion to the sport in India can be dated as early as the year 1721 where the first game was played in the subcontinent is a report of English sailors of the East India Company playing a game at Kutch. By the year 1792 the Calcutta cricket and football club had been formed and however another cricket club had been formed during 1799 at Seringapatam in South India. On 3rd march 1845 the Sepoy cricketers had played with the European cricketers in the place Sylhet located in (today's Bangladesh).In 1848 The First Indian club was named as the Parsee Oriental cricket Club and the first match was held in Bombay (Mumbai).The first class cricket begin in the year 1864 where a match was held up between the madras and Calcutta team. The Bombay Presidency Matches was held in the year 1877.Later that was named the Bombay Triangular and then as Bombay Quadrangular. In the year 1937-38 the name changed into Bombay Pentangular Matches. After this, four First Class matches were played between an English team led by Lord Hawke and an All India team between 26th and 28th of January 1893.An All-India team went on a tour of England in 1911 under Maharaja Bhupinder Singh of Patiala. The International Cricket arena is concerned, the team played since October 1926. In that year, a team from the Marylebone Cricket Club (MCC), led by A.E.R Gilligan toured India. Though it was an informal tour, the Indian people were quite attracted and fervent about the matches that MCC played during the tour. The legendary Indian cricket player, C. K Nayudu played brilliantly during that tour and he also scored a century against the MCC side in Bombay. The Board of Control for Cricket in India came into being towards the end of 1928.The first test match was played in the year 1932. With the efforts of several Indian princes, R.E. Grant Goven and A.S.De Mellow, the national championship for the Ranji Trophy began in 1935 and goes till now date. Prince Ranjit Singhji of Nawanagar who had gone to England for further study, made a striking name for himself in the game of cricket. He is generally accredited as the Father of Indian Cricket although he played only in England. He will always be remembered through the National Cricket Championship -Ranji Trophy, named after him. 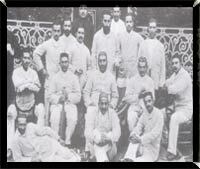 The Middle and the first half of the nineteenth century was the vital period in the History of Indian cricket From then on it began to spread among all the confined people in the country. Before the establishment of the test and international cricket, domestic competitions were being held within the states. The Board of Control for Cricket in India (BCCI), headquartered at Mumbai, is the national prevailing body for all cricket in India. The board was created in December 1928 as BCCI reinstated Calcutta Cricket Club. The former president of The BCCI was R.E. Grant Govan when the board started in the year1928. The contemporary President of BCCI is Shashank Manohar and the Secretary is N. Srinivasan. The BCCI have set up a 12 team inter-communal match to take part just before the start of the Ranji Trophy. 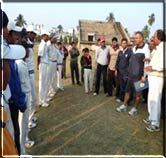 The tournament is a 50 over a side tournament involving communal teams from India. The Irani Trophy was named after the late Z.R irani who was allied with the Board of Control for Cricket in India (BCCI) from its commencement in 1928, till his demise in 1970. The first match, played between the Ranji Trophy champions and the Rest of India was played in 1959-60 with the trophy being organized in the name of Zal Irani, long time treasurer of the Board of Control for Cricket in India and a keen benefactor of the game. The Irani Trophy game ranks very high in fame and import. Leading players take part in the game which has often been a class of selection trial to pick the Indian team for foreign tours. In 1994-95, the Board of Control for Cricket in India BCCI introduced the Challenger series, an annual day-night one-day tournament, keeping in view India's one-day international commitments.This tournament is played in October before the launch of Ranji season.From 1998-99 the tournament was known as the NKP Salve Challenger Trophy, named after former Board of Control for Cricket in India president NKP Salve - the man who brought the World Cup to the sub-continent in 1987.The tournament features the top 36 players from across India and is also the most popular domestic structure. Originated as the 'The Cricket Championship of India' at a meeting of the Board of Control for Cricket in India in July 1934. The first Ranji Trophy contest took place in the 1934-35 season.The competition is named after Kumar Shri Ranjitsinhji (Jam Sahib of Nawanagar, also known as "Ranji").The first Ranji Trophy Championship was won by Bombay.Syed Mohammed Hadi of Hyderabad was the first batsman to score a century in the tournament. The Ranji Trophy is composed of teams representing the states that make up India.The teams used to be set into zones - North, West, East, Central and South - and the initial matches were played on a league basis within the zones. The Duleep Trophy competition, a first-class competition, was started by the Board of Control for Cricket in India in 1961-62 with the mean of providing a greater spirited edge in domestic cricket .The Duleep Trophy is played in India between teams representing geographical zones of India. 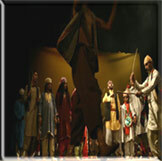 The competition is named after Kumar Shri Duleepsinhji. Vijay Hazare Trophy was started in 2002-03 as a bound over domestic competition involving state teams from the Ranji Trophy. It is named after the famous Indian cricketer Vijay Hazare. BCCI commenced Twenty20 in 2006-07, India played its first international T20 against South Africa. The Indian Premier League (IPL) is a expert league for Twenty20 cricket rivalry in India. It was initiated by the Board of Control for Cricket in India (BCCI) headquartered in Mumbai.It is overseed by former Chairman and Commissioner of the Indian Premier League Chirayu Amin.The first season of the Indian Premier League Statred in the year 2008. This was instigated after the success of the IPL and the need of the BCCI to search for more talent in the growing regions of cricket.The inaugural of this trophy took place in the year 2008-2009 season. It is named after a famous Indian cricketer, Syed Mushtaq Ali. India's first Test Series victory against Pakistan did take place in the year 1952 after Our independence. The series saw dazzling and amazing performances from some of the greatest Indian Cricket players like Polly Umrigar, Vijay Manjrekar and leg spinner SM Gupte. The Indian Cricket team during 1960's proved its strength upon the home ground as well as upon foreign pitches too.During this year the talented players were Mansoor Ali Khan Pataudi, Dilip Sardesai, Hanumant Singh, Chandu Borde and off-spinner EAS Prasanna. During 1970's India had a spinners's time where many players like Bishen Singh Bedi, (left-arm spinner), Erapalli Prasanna (off-spinner), BS Chandrasekhar and Srinivas Venkataraghavan (off-spinner) were a great chattels for the Home team .The Indian Cricket team also got two of its most talented Batsmen of all times during the period of 1970's itself � Sunil Gavaskar and Gundappa Vishwanath. During the 1980s,India had developed batsman like Mohammed Azharuddin, Dilip Vengsarkar and all-rounder Ravi Shastri.Beneath the captainship of Kapil Dev, the Indain team won the 1983 Cricket World Cup. In 1984, India won the Asia Cup and in 1985, won the World Championship of Cricket in Australia. During the decade of 1980's Gavaskar made a Test record 34 centuries as he became the first man to reach the 10,000 run mark. Kapil Dev afterward became the highest wicket taker in Test cricket with 434 wickets. The addition of Sachin Tendulkar and Anil Kumble to the national side in 1989 and 1990 improved the team. The following year, Javagal Srinath, India's fastest bowler since Amar Singh made his debut. The Cricket team of India had the new talented during the 2000's like Mahendra Singh Dhoni, The captain of India for both the One day International and Test Cricket . Under the animated captainship of Dhoni, the new young team lucratively won the first Twenty-20 Cricket World Cup held in the year 2007. India started playing cricket long back and the game slowly started getting notoriety.